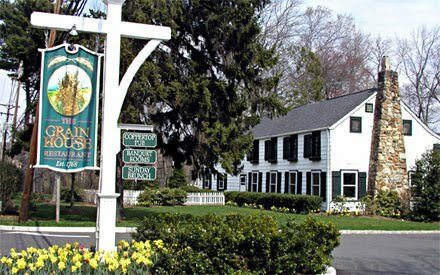 I recently had the privilege of touring the Olde Mill Inn in Basking Ridge, New Jersey. I had attended a charity event for the Wish Upon A Wedding foundation a few weeks earlier and I met Marien Barker, the Sales Manager for the Inn. We hit it off and she graciously invited me to the Olde Mill Inn for a tour and lunch. I had never been there before and I didn’t know what to expect. As I drove up, I was certainly impressed by the grandeur of the hotel with its beautiful columns and entryway. I parked my car and proceeded inside eagerly. I found that the inside of the hotel was even more impressive than the outside. The place just exuded warmth and charm. The decor, music and the roaring fireplace instantly shook off the freezing cold of winter. I was met by a very pleasant and professional desk attendant who alerted Marien to my arrival. Marien met me in the lobby and after exchanging pleasantries, she took me on a guided tour. First, we visited the Bridal Suite where brides-to-be prepare for the big day. When they say suite they mean it. There was a beautifully appointed living area complete with antique furnishings, a kitchen/dining area, and a separate large bedroom with a very comfortable-looking king bed. The suite even had a fireplace! A full bath with a jacuzzi tub and another half-bath round it all out. It would definitely be a comfortable place for any bride to ready herself. Next, we went to see a guest suite that was very tastefully decorated and warm. 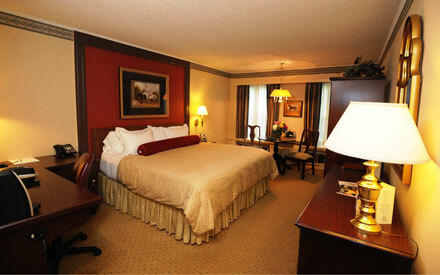 I could envision my husband and myself enjoying a long weekend at the Olde Mill. Maybe someday soon. 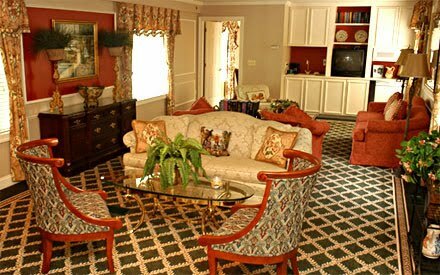 The Olde Mill prides itself on being “green” and they offer their ‘Pure’ allergy friendly rooms. As an allergy sufferer, I was pleased to hear about this trend in hotel accommodations and that the Olde Mill is at the forefront. After touring the rooms, Marien guided me to the Grand Washington Ballroom. It’s a large, neutral-colored venue that won’t overpower your wedding decor. It’s definitely not your “wedding factory” type of venue, it has a personal touch that just makes you comfortable – kind of like you belong there. I hope one of my friends gets married here – I’d love to attend! We left the ballroom and went upstairs to the sales offices. Marien introduced me to Catherine, the director of sales for the Inn. She was very friendly and invited us into her office we chatted and I showed her some of my invitations. She loved them! Then the conversation turned to David Tutera. We all love him! Marien then led me across the grounds to the Grain House, the Olde Mill Inn’s rustic styled restaurant. It’s an old farm house from the 18th century. It’s a really charming place with exposed wood beams and old-world colonial decor. It’s actually the original inn. The place was packed with a lunch time crowd. We sat down and chatted a little about the Inn and the weddings and events that are held there. The food was excellent! After lunch, Marien took me to see the other wedding venue on the grounds. This one is located in the Grain House building. It’s named the “Hunt Room” and it’s a smaller ballroom than the Grand Washington. 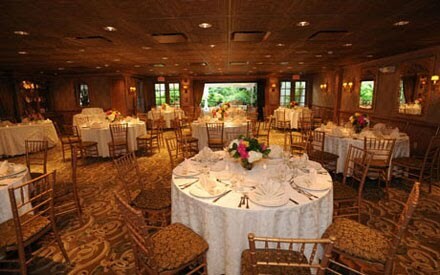 This room is perfect for a more intimate wedding and is again neutrally decorated and has an outdoor patio and gazebo. It goes right along with the comfort and charm of the whole place. I’d been at the Olde Mill for two hours and it was time to get home to my family. I expressed my gratitude to Marien for the hospitality and I got on the road. On the way home, I kept thinking about how great the Olde Mill Inn is and I wished I would have known about it when I was planning my own wedding. I’ll definitely recommend it to my friends!